In recent times, viral fame has facilitated user acquisition and installs for mobile apps, quite instantly. Unfortunately, not every app is a Dubsmash or Clash Of Clans. Needless to say, with heavy competition and transient quality of viralition, growth can get stagnated, or user retention may get affected. App marketers need a sustainable growth hack. A kind of marketing loop that requires minimum monitoring but which promises consistent user acquisition, user retention, and app installs, in other words-proven growth. At AppVirality, we’ve mentioned the benefits referral marketing over and over again. With stiff competition in the cab-hailing segment, this growth hack has been able to turn the tables for app marketers more often than we know. That’s when we decided to dissect yet another growth story in this space. The app in question witnessed exceptional growth in their initial year, and their turnover rose by one-fifth to £127.5 million! 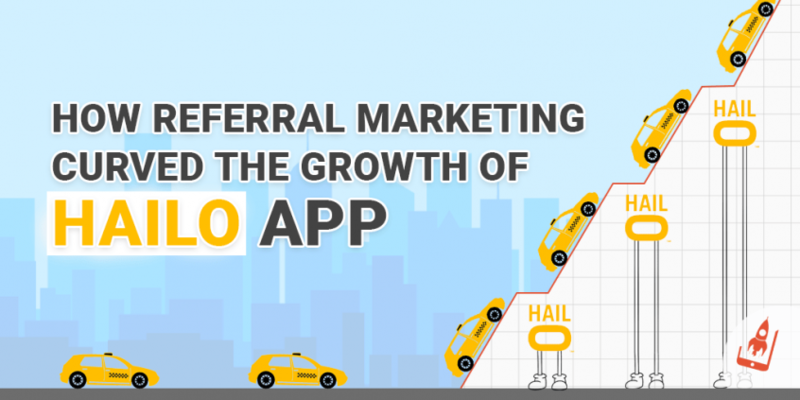 Hailo’s growth trajectory is the core focus of the article- however, we couldn’t help but notice how this cab-hailing mobile app bend its curve with evergreen growth hacks like word of mouth and In-app referrals based on the principle of referral marketing. Let’s take a closer look at what makes this mobile app story worthy of a discussion. Hailo’s initial story wasn’t growth oriented. Even with a $100 funding it wasn’t able to appease users in the USA, which were hung over apps like UBER and Lyft. With an incredible growth history in London, the app was looking at avenues to expand in a not so saturated market. Little did they know that it would come with its own set of challenges. Ireland changed the game for the mobile app. Not only, it was an experimental- a sort of testbed for Hailo, it also brought them on international level spreading all over Ireland cities. Hailo’s initial, challenge was to battle, heavy competition from private drivers and independent cabs, increase awareness about its brand identity and counter stagnation in install rate post the sudden boom. Referral marketing is the oldest trick in the marketing books. However, brands forget to leverage it to the fullest due to lack of clear understanding of its fundamentals. Hailo used word-of-mouth to create brand awareness and attracting users to its In-app referrals program. They then hopped on to In-app referrals to continually attract app installs and ensure growth in a new market. Word Of Mouth Becomes Hailo’s Halo! In the video below recorded at the Dublin Growth Hacker’s Event , Rob Cumiskey, Hailo’s marketing genius explains how they created a distinctive brand identity and worked towards a sustainable growth. Hailo’s marketing team realized that they needed a good brand image to shine through the crowd of competitors. Through their Livery Programme, drivers adopted exterior or interior branding to gain on-street presence. The Livery programme set the pace for word of mouth and also elevated the brand image substantially. As Rob Cumiskey explains in the above video, Word of Mouth was necessary and a fruitful strategy. They got taxi drivers to talk as they realised every driver will be interacting with passengers all day. A more ingenious and organic way of bringing people in, word of mouth worked as the best strategy at the initial phases. It became world’s highest-rated taxi app over 10,000 five star reviews. Hailo took word of mouth to another level by bringing in in app referrals and promocodes into business against tough competition. The above strategies were met by heavy competition. Hailo faces a big DROP! After Hailo managed to employ referral marketing and create a space for themselves in the market through word of mouth and massive advertising, they faced a big impediment. There was a drop in Hailo’s downloads statistics. People had downloaded the app, but they hadn’t registered their accounts. And the ones who had registered had no first hail! This was when Hailo team focussed on “maturing the pace of their start-up” and a sustainable growth hack. Such kind of growth hack should not only eliminate the competition but get their customers churning. George Berkowski in his book, How to Build a Billion Dollar App talks about Incentivised Virality. A ‘classic marketing idea’ that Hailo used by giving their users incentives for bringing their friends. App marketers understand that incentives can be in any form- Money or ‘virtual’. They also know the deal is to be cost effective. This is what Hailo mastered brilliantly by focussing on acquisition and retention. They digitalised their approach and started mobile marketing. Let’s take a look at Hailo’s creative in-app referrals campaigns. Hailo became quite innovative with their campaigns. The simplest way to increase install rates was by letting their users recommend the app to their friends. But why would someone care to refer the app? Unless, the users had something in it for them. Hailo brought numerous such referral programs that were a win-win situation for both of the parties. Hailo didn’t just become number one app. They did by understanding their target audience. Instead of enticing only the user end, they brought the drivers to take advantage of their referral programs. In case of a new signup, a driver would get 25 bonus in the festive season. Targeting travellers on vacation time when most of the people are left out in the night was Hailo’s next big strategy. They advertised their promo code and asked the first time users to earn €20 from their first use. The catch was to pay with card using HailoPay. @HailoIreland Any Christmas promo codes this year like you done last year? Christmas party tomorrow and would love to promote Hailo again. Hailo Promotes Friends With Benefits – The Biggest Shining Armour! A friend is a friend in need, right? Hailo definitely believes in it. Therefore, when it introduced its referral program, stress was on the words ‘friendship ‘ and ‘benefits’. The current users had to share their provided code and invite friends and family who weren’t yet on Hailo. Both the users got €10 free on their rides! This worked as a great way to engage the users, and to get the installation number increasing, Hailo swiped through the crowd by its catchy ‘Friends with Benefit’ referral program. There’s no end to it. The users can fill the tank of their credits with every new referral and sign up. Powerful isn’t it? Wait till they used the social media powerhouse and exploded on the internet! The Conjugality Of Promo Codes And Twitter! Now that the referral program was an instant hit with the users, it needed a national reach. Hailo promoted the users to share their code on social media like Twitter and Facebook. This further advertised the app. The best content to share on social media was their promo codes, which they shared on Twitter, excessively! Hailo used promoted codes with geo-targeting to attract users in Ireland. They targeted users based on weather, transportation, concerts, sporting events or conferences or event in generic situations. The tweets were relevant to the audience. @Meadhbh_Crowley Don't forget to use our promo code HAILOPRIDE14 for €5 off your journey Méadhbh! They also used device targeting relevant to iOS and Android. For Android users, the links of Hailo app were given through Google Play and for iOS users links were of iTunes. “It’s officially the best funded startup in Europe ever,” CTO Rorie Devine says of Hailo. We’re sat in Hansom, a meeting room named after a format of a cab. “This is like Betfair on steroids for hyper growth,” he enthuses, comparing the two organisations. “We are in a different place in our maturity curve, which is all about growth, quality of service to both drivers and to passengers,” he says of the young company. There are three E’s to Word of Mouth. Engage, Equip and Empower. Hailo used all three E’s to counter stiff competition even after being a late entrant. It became a top contender with the credit going to its referral strategies. What do you think of our Hailo growth story? Did referral marketing inspire you towards your growth? Let’s discuss it in our comment section!